Fall has already been so strange aroun here. We got snow October 2nd! And not just a little bit – about 8 inches of it. It’s melted mostly since then, but also snowed a couple more times. All this snow has me wanting to cozy up inside and never leave the house! We are still out of our home from this summer’s water damage, but I’m still trying to find ways to make this house feel like home. 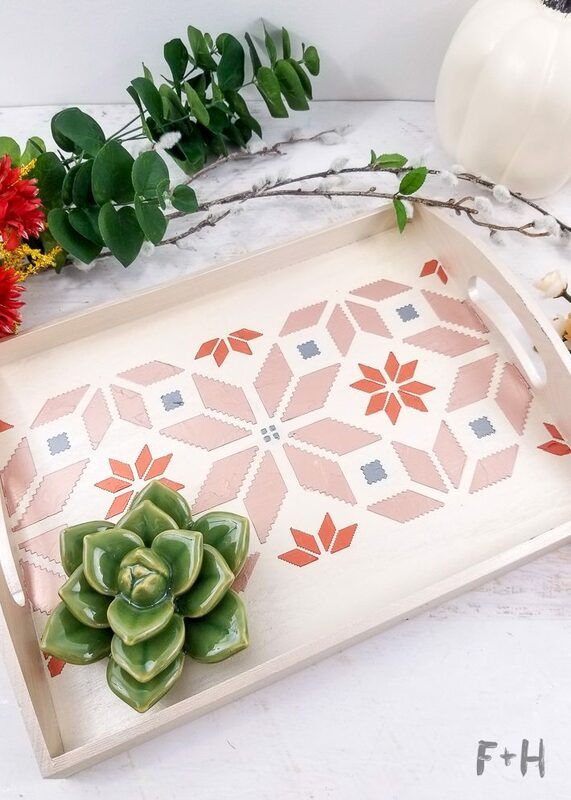 This decorative wood tray is a metallic ray of warmth that I’ve loved styling on the kitchen table. It’s the perfect palette for fall but I think will also transition into the Christmas season really well too. 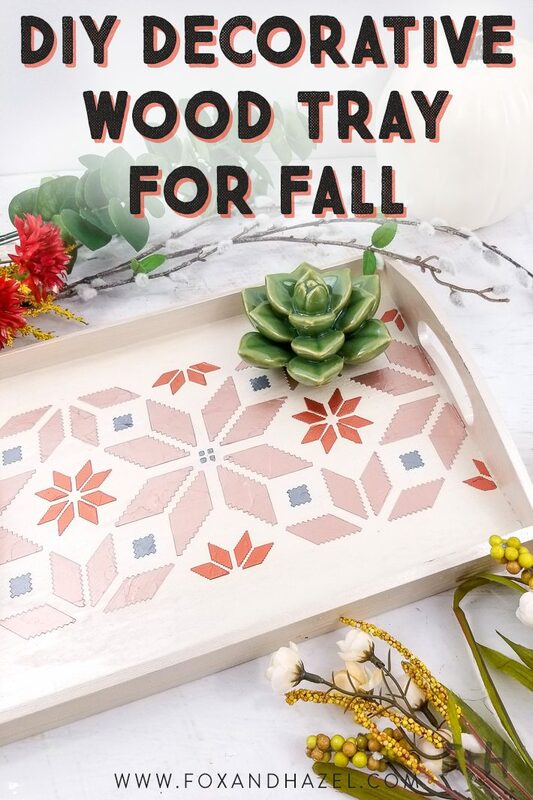 I’ll show you just how easy it is to make a decorative wood tray for fall! 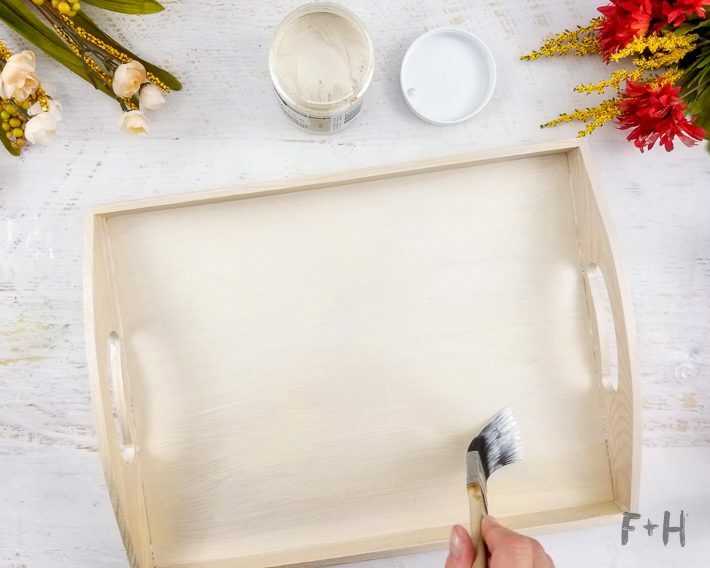 First I applie two coats of the Matte Metallic paint Ivory Pearl to the entire decorative wood tray. I used a small house painting brush rather than an artist’s paintbrush for this. Be sure to go with the wood grain and catch any drips you might have! 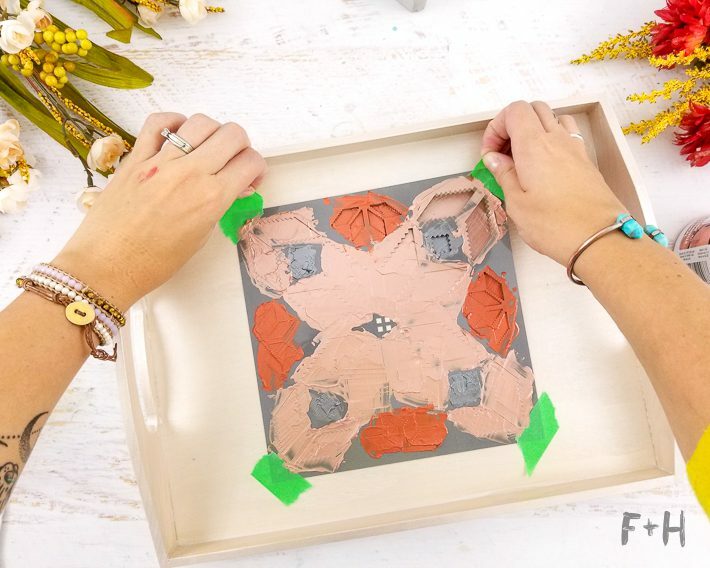 You can use a heat gun to speed up the drying time too! Let the paint cure completely before the next step! Once the paint on the tray was dry, I marked out the very centre of my tray. Then I taped down the Scandinavian Stitch stencil in the very centre. Using a palette knife, I carefully pushed the Metallic Texture Paint through the stencil. I really recommend getting an angled palette knife like mine because it makes it a lot easier to push the paint around on a flat surface. The Texture Paint is THICK, which means it behaves a lot like modeling paste (if you’re familiar with that!) I chose to do different parts of the stencil in Rose Gold, Warm Copper and Zinc. Just be careful that you don’t push one color into another area by accident. 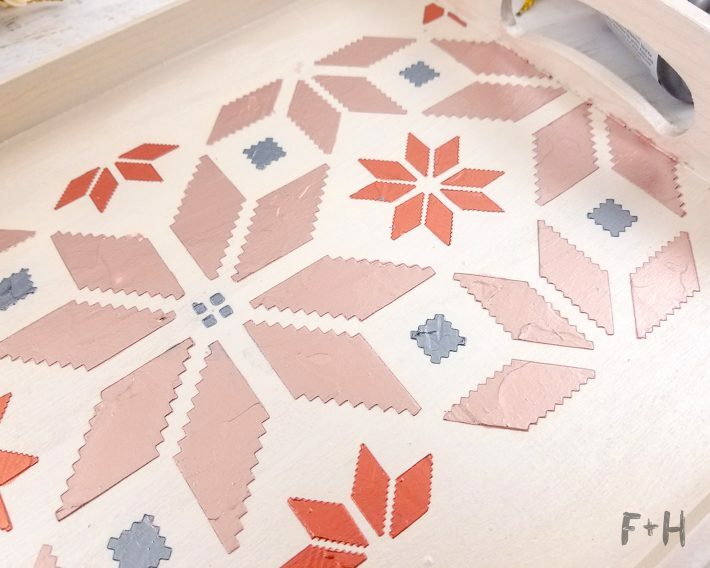 Once all your areas of your stencil are covered, carefully remove the stencil and let dry! Now, I decided to commit stencil murder and cut mine in half so I could stencil the sides. 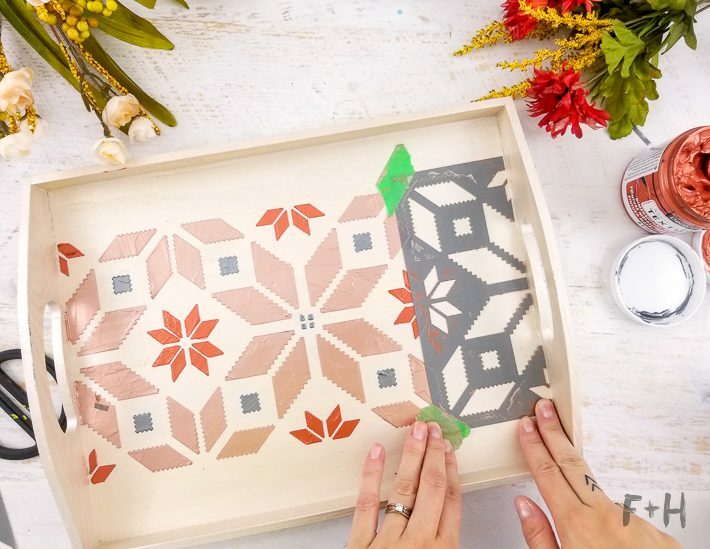 I tried to see if I could bend the stencil, but these DecoArt stencils are made of thick mylar which means they don’t want to bend easily. Normally this is awesome, but for my purposes it meant I had to do a little surgery to my stencil. 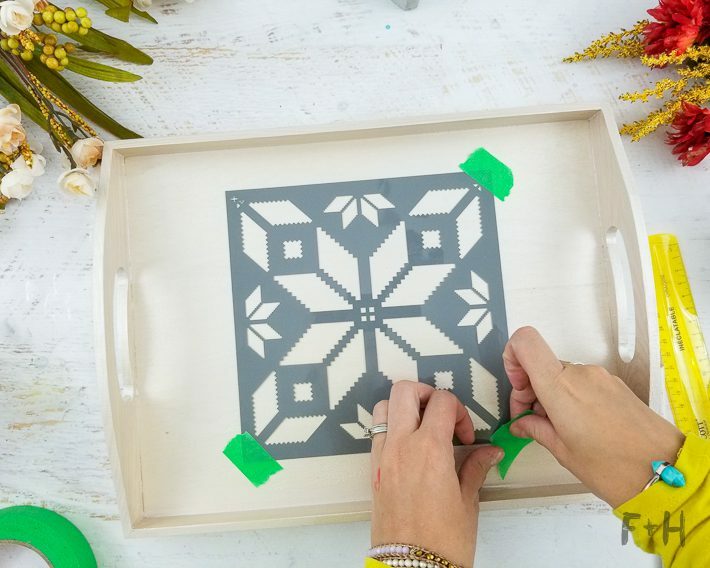 I cut the stencil to fit the repeating pattern and repeated the stencil + paint process on both sides. 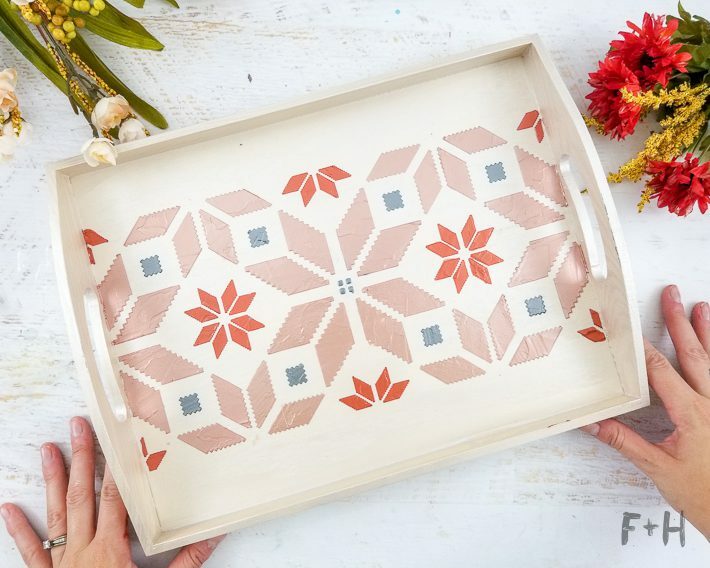 I love the continuation of the pattern so cutting up the stencil was worth it! 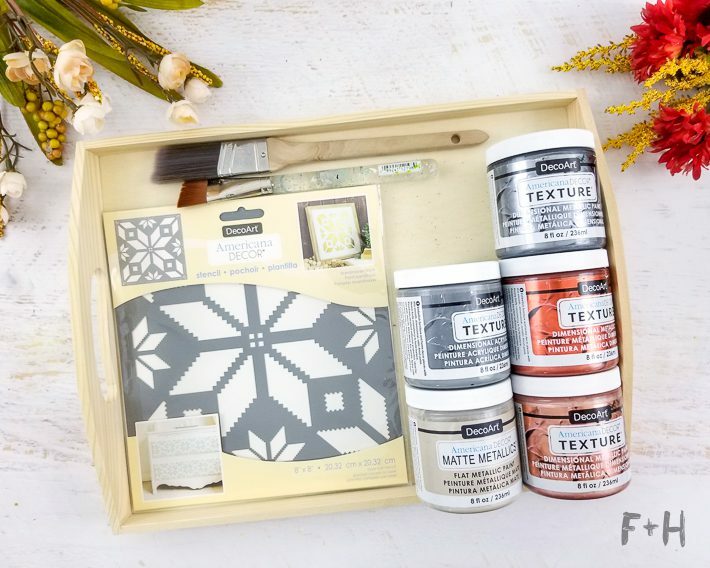 Let your paint dry overnight to ensure the texture paste is completely cured. And it’s done! 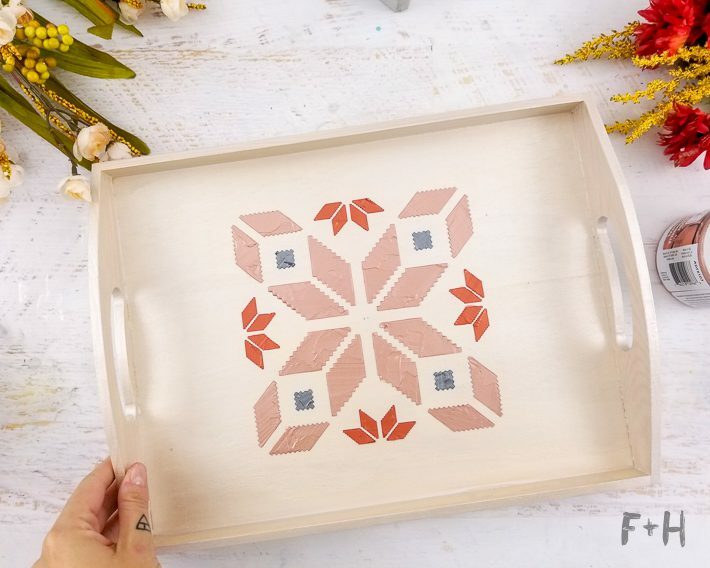 This decorative wood tray turned out so beautiful! 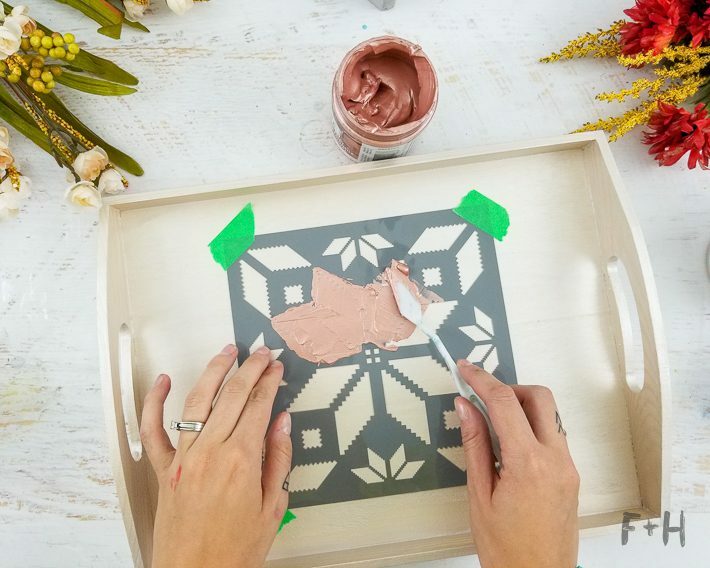 I love the metallics in the warm autumn colors, and it goes great with some of my other DIY fall decor ideas (like these painted antlers! 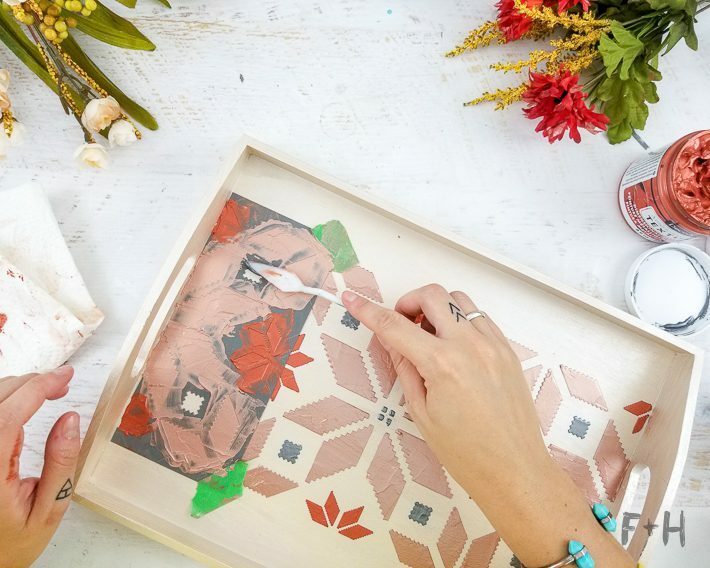 or this fall watercolor floral print!) I actually think would be a really lovely decor piece for the Christmas season too, or as a housewarming gift. If you love this post, you can spread the love in one of these ways! Link back to this page!